"Farewell to Hamburg is my story as a child whose father was in the Wehrmacht having joined at 19 years of age in 1932 and then met our mother in about 1936. Until war was declared our lives were peaceful and we spent many family times together as we lived first in the barracks and then later as accommodation needed to be bigger, outside and next to the barracks our father was stationed in. Our grandparents of our mother had a shop selling vegetables and we were comfortable in our lives, visiting them often and also the parents of our father who lived north of Hamburg toward the border with Denmark. We all thought we had a great future! Then WW2 commenced, slowly at first but soon Hamburg was being attacked with bombs and we were evacuated away to Coswig near Dresden. Our mother was able to come with us, our father also visited us often in Coswig, all changed as we heard he had been reported missing presumed dead in 1943 in Russia. Things for our mother and us two young boys now became very difficult. Eventually we were back in Hamburg as our mothers parents needed her to help in their business. We were in Hamburg during the Firestorm bombing that killed over 40,000 people. 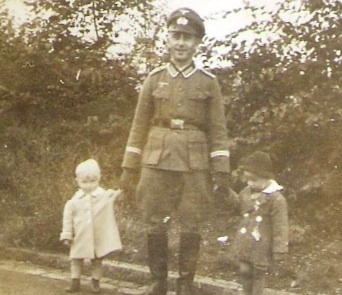 AS just a normal German family we suffered much stress and all due to a war we did not wish for. Many books have been written about WW2 but not one that covers what ordinary Germans suffered and I believe my book does that. It would be good to know it will be available to as many people to read in this world, it may help to mend some of the ill feelings there still are against German people."